It is possible to bake many pastries without eggs, making them perfect for vegans or people with egg allergies and sensitivities. The following recipes do not contain eggs, but they remain delicious. Shortcrust pastry is used to make tarts, pies, and quiches. It is a yeast-free, egg-free pastry that can also be made completely vegan depending on the type of fat you choose to use. This recipe calls for butter, but cooks can replace it with an equal amount of dairy-free shortening or margarine. Use this shortcrust in the tart recipe that follows. Sift the flour, baking powder, and salt together and place in the bowl of a food processor. Scatter the butter over the top of the flour mixture. Pulse for 10 one-second pulses, until the mixture resembles coarse sand. Transfer ingredients to a bowl. Working one tablespoon at a time, add water and gently mix until the dough forms a shaggy ball. Do not overwork the dough. This apple tart uses a rolled shortcrust pastry and a combination of sweet and tart apples. Wrap the tart dough in plastic and chill it for 30 minutes. Remove it from the refrigerator and let sit for five minutes before working the dough. Heat oven to 400 degrees. Line a baking sheet with parchment paper. On a floured surface, roll the tart dough into a large round that is 1/8 inch thick. Carefully transfer the dough to the parchment-lined baking sheet. 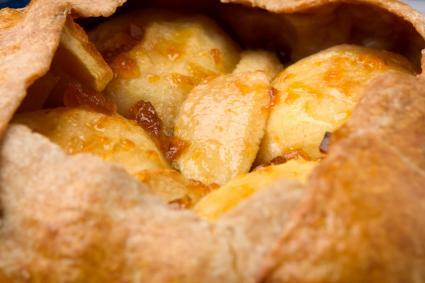 Mix the apple slices together in a large bowl, and then pile them in the center of the dough. Fold the edges of the dough up around the apple filling to create a free-form tart, leaving the center open to reveal some of the apples. Pinch edges of dough where they meet to seal them. Brush the dough with melted butter, and sprinkle the tart with the sugar. Bake until the apples have softened and the crust has browned, about 45 minutes. Cool on a wire rack for 10 minutes, and then carefully slide the parchment and tart from the cookie sheet to the wire rack to continue cooling, at least 15 minutes more before serving. Serve warm or cold. Puff pastry takes a little bit of work, but it is a very versatile pastry that can be used in sweet and savory applications. Use LoveToKnow's puff pastry recipe instructions to make your own, or you can purchase pre-made puff pastry from the freezer section of the grocery store. Then, use the puff pastry in the following sweet and savory applications. 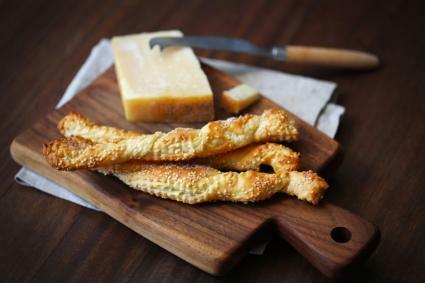 These savory straws make an elegant appetizer. Preheat oven to 400 degrees. Line a baking sheet with parchment. In a food processor, pulse the basil leaves and garlic cloves for 10 one-second pulses until well chopped. Add the pine nuts, olive oil, and Parmesan cheese. Process until all ingredients are finely chopped and well combined. 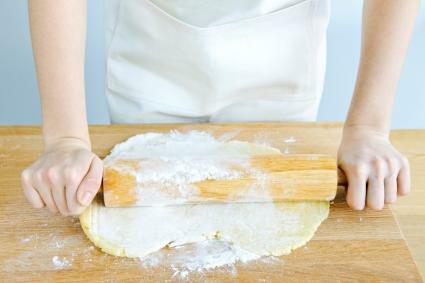 On a floured surface, roll the puff pastry into a rectangle that is roughly 12 x 15 inches. Spread the pesto evenly over the dough, leaving about 1/4 inch all the way around the edges. Fold the dough in half along its length. Roll the dough again until it is 12 x 15 inches. Sprinkle the dough with the sesame seeds. Cut the dough crosswise into strips that are 1/2 inch thick each. Twist each strip lengthwise into a corkscrew shape. Place the twists on the parchment lined baking sheet. Bake in the preheated oven until golden brown, about 10 minutes. Serve warm or cold. This recipe uses the puff pastry in a sweet application. On a lightly floured surface, roll the puff pastry into a 12 x 16 inch square. Cut the pastry into 4 x 4 inch squares and place them on the prepared baking sheet. 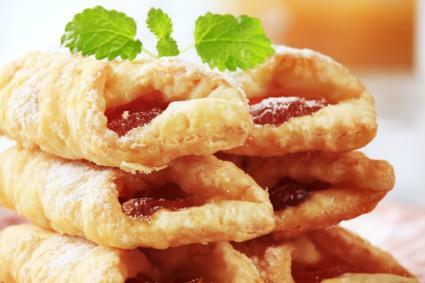 Place one tablespoon of strawberry jam or preserves in the center of each square. Fold two opposite corners of the puff pastry so they meet in the center, forming a rough diamond shape. Press edges together to seal. Brush with the melted butter. Bake in the preheated oven until the pastry is golden brown and puffed, about ten minutes. Transfer to a wire rack to cool. Dust with powdered sugar and serve warm or cold. Many different types of pastry are egg-free and can be used in both sweet and savory dishes. With a few egg-free pastry recipes in your repertoire, your cooking options will expand.